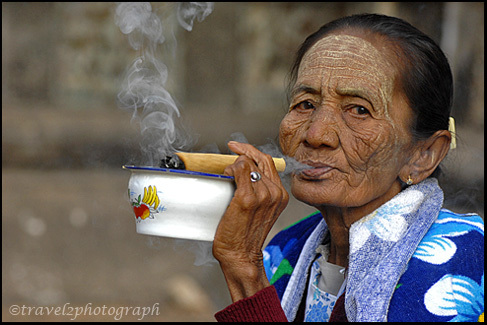 I have always been fascinated by images of Burmese women smoking gigantic cigars. 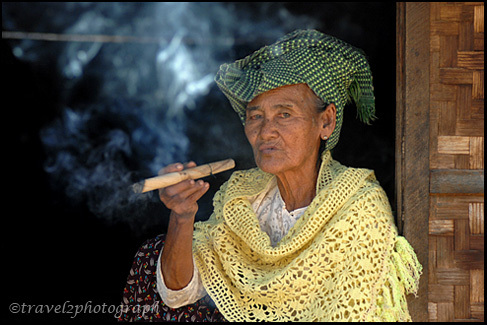 A cheroot can be described as a cigar with both ends cut square. 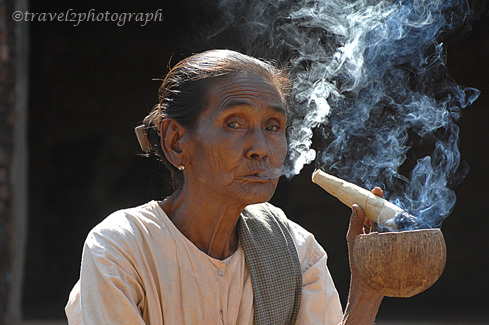 Although they are smoked in different countries of the world, cheroots are usually associated with Burma, perhaps because the country’s former masters, the British, took a liking to them too. 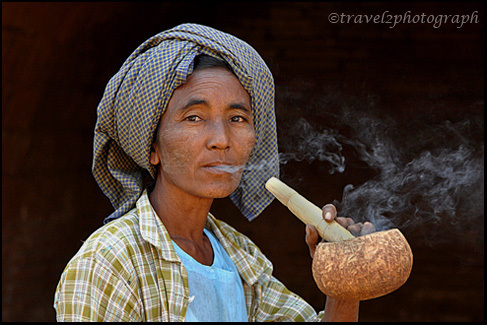 Cheroot smoking was so widespread in colonial Burma that an imperial administrator once described them as “a Burmese facial feature.” The cigars also feature prominently in the works of authors such as George Orwell (Burmese Days) and Rudyard Kipling (Mandalay). 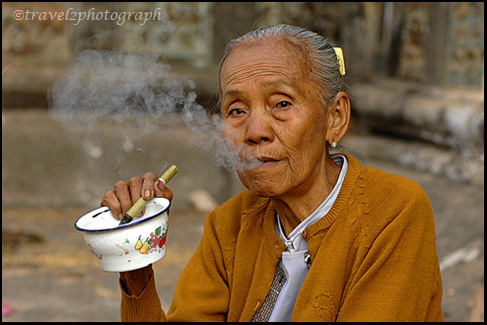 Myanmar ladies smoke the cheroots, because it can freshen the mouth due to its fragrance and sweet taste. Mild tobacco cigars can’t harass to health. They pluck the Tha-nat (leaf) of the sebesten tree, have it dried & flattened to wrap & roll. The ‘filter’ mostly exists of a small roll of dry corn husks. Inside the cigars you can retrieve a mixture of chopped soft stalk of tobacco leaf. 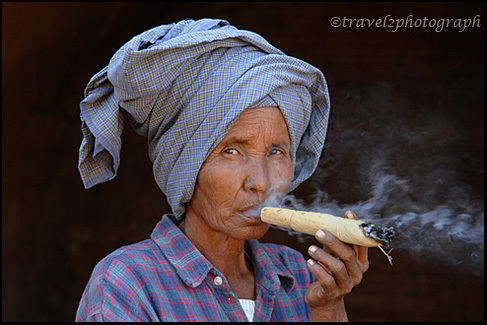 In Myanmar, cigars are often used as take away gifts for guest during ceremonies. The cheroot industry is quite a big one, and the cultivation of the leaf plantations is often the main cash crop in areas such as the Shan State. 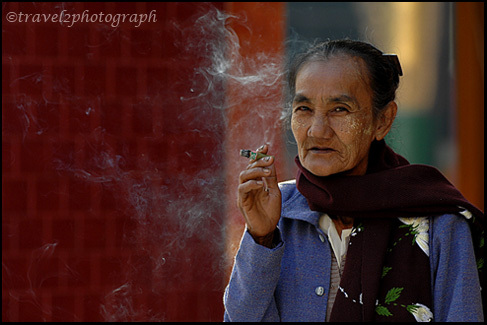 Terrific photos and snippets of this tradition.It appears that just women smoke the cheroots? Again, very, very nice photos. Incredible photos! Wow! Are you in Burma now? Excellent set of photos. Came upon your site whilst looking up the spelling of ‘cheroot’. Looking forward to perusing through some more of your galleries. BTW – petalpusher, fyi: men smoke them just as commonly. It’s just, kind of, an exception to find women smoking within an Asian culture.